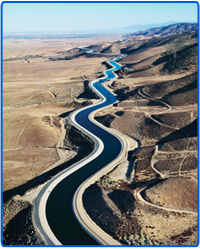 The Los Angeles County Waterworks Districts (LACWD), a division of the County of Los Angeles Department of Public Works, provides customers with water from three sources: local groundwater and water imported through the State Water Project (SWP) and the Colorado River Aqueduct (CRA). The State Water Project is a system of reservoirs, pump stations, storage facilities, power plants, and 660 miles of pipes and canals that spans two-thirds the length of California. LACWD purchases imported water from local SWP contractors including Antelope Valley-East Kern Water Agency, Castaic Lake Water Agency and Metropolitan Water District of Southern California, or regional wholesale water agencies such as Los Angeles Department of Water and Power and West Basin Municipal Water District. The majority of the water in the SWP is collected as runoff and snowmelt from Northern California and the Sierra Nevada Mountains. While the source water is very pure, it collects sediments and organics along the way and must be treated before it is delivered for human consumption. The imported water is generally treated using conventional treatment methods including coagulation, flocculation, sedimentation, filtration, and disinfection. The Colorado River Aqueduct stretches 240 miles from Lake Havasu on the California-Arizona border to Lake Mathews in Riverside County. California has been taking over 5 million acre feet of water from the Colorado River a year even though they are only entitled to 4.4 million acre feet. The Metropolitan Water District is a consortium of 26 cities and water districts that imports water from the SWP and CRA to supply drinking water to much of Southern California. In areas where local groundwater is available, LACWD owns and operates groundwater production wells which are used to pump the water from the groundwater basin to the surface. The groundwater is then disinfected and pumped into the distribution system.